Hi! 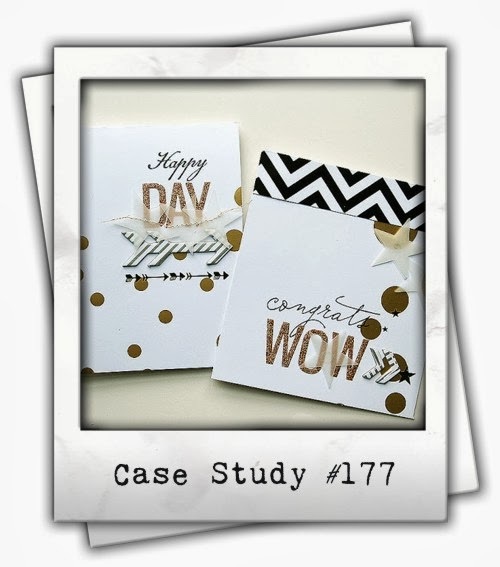 I'm sharing a card that I made for the CASE Study Challenge #177. Take a look at the inspiration provided by their February muse...Danielle Flanders. Love her work! I was inspired by that bold chevron at the top of the Wow card, on the right. I also love her use of vellum for the die cut stars...oh, and the bold use of gold. Yes. Love the gold. Originally, I had planned to use a chevron patterned paper, but when I saw this bold triangle pattern in my stash I knew it was perfect for this card. I used a Spellbinders die to cut a window into this panel. Since this patterned paper wasn't very thick, I layered it with some white CS to give it a little heft. Then I popped it onto the card base with foam tape, before adding the heat embossed vellum feathers. The gold dots are brushed gold card stock that I simply punched out with a 1/4" hole punch. This came together quickly and was so much fun to make. I'll be placing this card in my Etsy shop soon. I've not added anything to my shop in quite some time and I really want to devote more time to it. Here is a link to MyLittleBirdStudio at Etsy. Or there is always a link in my blog's side bar. Keep in mind that I love doing custom orders, too! Beautiful card, Susie! Love that striking paper! I just bought the feather set....love it! Never thought about stamping them on vellum, but I love the look and that gold is fabulous! Your card is stunning!!! Love those feathers! Gorgeous card!! Love the design, the colors, the glam, pretty much everything!! Terrific card! Love the golden feathers!